IBBY Athens was my fourth IBBY Congress. 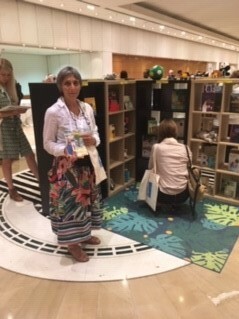 Attending an IBBY Congress is hugely enriching on a personal level, but the networks and the level of engagement with colleagues around the world also helps us do a better job of running IBBY in the UK. It reinforces how important these networks are, particularly in troubled times, and reminds us both of how much we have in the UK and how much we can learn from others. 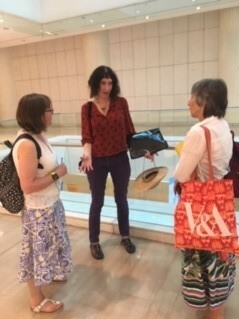 There was a strong UK presence in Athens and we networked as widely as we could. The concept of xenia, of hospitality of welcoming the stranger is legendary in Greece – and re-reading The Odyssey in Emily Wilson’s wonderful new translation, as I was over the summer, really emphasised this. We experienced huge gestures of hospitality wherever we went and were enormously impressed by the way that Greece, despite its economic crisis, is coping with an unprecedented refugee situation. This is xenia on a different level. With some distance from the Congress as I write this, I want to comment on a few of the standout experiences for me. Deborah Ellis’s very powerful paper on ‘The day before’, which we hope can become a rallying cry for IBBY and which deserves a huge audience, documented her vision of children’s literature as a way of preparing young people for life and for taking an active role in making better futures for the world. Gregory Maguire’s entertaining and sophisticated and honest paper about life as a fairy tale was full of insight into the modern world – and has left me with the wish to see Wicked as soon as I can. I wish I had known more of his writing. It was a magical experience to meet Jeannie Baker, whose work I have loved and used for many years. Hearing her stories of the work that goes into each book and the authenticity of each project was enormously impressive. I hope she does a tour in the UK one day soon (Walker, please note). This was one of an enormous number of parallel sessions and it was impossible to get to all that I wanted to go to. Thea Shahrokh from the Centre for Trust, Peace and Social Relationships in Coventry University participated in an excellent trio of speakers and her project recounted an extremely interesting approach to working with refugees to help them write their own stories. We have asked her to write for IBBY UK about this. As always at Congress there is much IBBY business to be dealt with which does take time away from the programme. It is a good way to catch up with issues from round the world and to plan future events. We will be working with our European colleagues to plan a conference as part of the Bologna Book Fair on Thursday, 4 April on the theme of Language. The IBBY UK contingent was a joy to spend time with and the shared house approach certainly helps to make the Congress both more affordable and more enjoyable. Russia will be the next Congress from 5-7 September 2020.